← Richard Price -Elected RMBC Representative for Wingfield ? 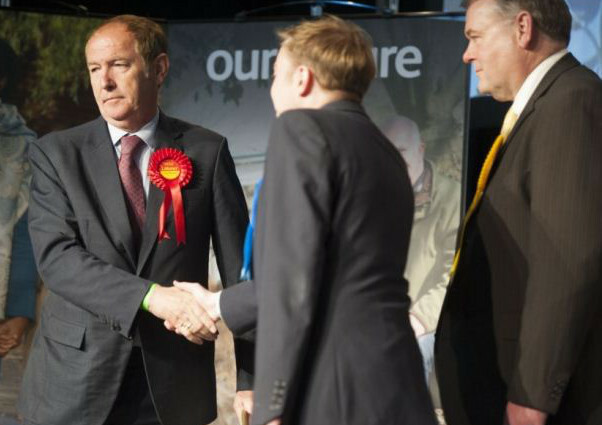 Labour’s long-serving MP Sir Kevin Barron is looking forward to five more years in Parliament for the same constituency he has represented since 1983. The veteran MP increased his majority in his Rother Valley seat, holding off the challenge of UKIP’s Allen Cowles. The MP had a 5,866 majority in the 2010 election, and successfully increased this to 7,297. Sir Kevin polled 20,501 votes, ahead of Mr Cowles with 13,204 and Conservative Gareth Streeter with 10,945. Labour took a 43.6 per cent share of the vote in the constituency, with UKIP getting 28.1 per cent and the Conservatives 23.3 per cent. The re-elected MP said he is concerned about the prospect of a new Conservative government and said he would have to fight to represent the interests of his constituents. “I fear for what is going to happen to the people of Rother Valley, but I will be the voice for them,” he said. Sir Kevin said the disappointing Labour performance nationally meant it was important for those voted back in to do their best. His victory was the last result of the night to be announced at the Rotherham count and meant all three local Labour MPs retained their seats, despite hopes from UKIP that they could win in at least one constituency following the child sexual exploitation scandal which involved the Labour-run Rotherham Council. Speaking prior to the results being announced, Mr Streeter said he was delighted with the way the national election results had turned out for the Conservatives. “Nobody is going to speak to any Conservative in the country who isn’t pretty much over the moon right now,” he said. Liberal Democrat Robert Teal polled 1,992, with English Democrat Sharon Sutton receiving 377 votes. Turnout was 63.57 per cent in the seat, slightly down on 2010. This entry was posted in Uncategorized and tagged Kevin Barron MP, Labour, parliament, Rother Valley, veteran MP, Worksop Guardian. Bookmark the permalink.